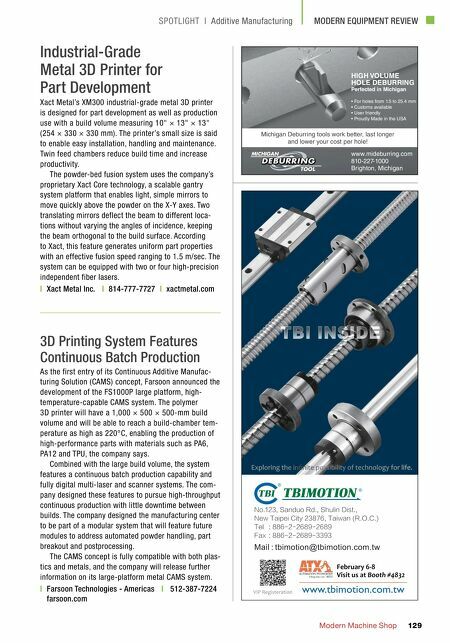 MODERN EQUIPMENT REVIEW SPOTLIGHT | Additive Manufacturing MMS FEBRUARY 2018 128 mmsonline.com The MU-8000V Laser EX multitasking CNC machine from Okuma combines laser additive manufacturing technology with subtractive manufacturing capabilities to enable complete part production on one machine. The MU-8000V Laser EX combines laser metal deposition (LMD) technology with the ability to cut parts of many different sizes and shapes. The LMD process supplies powder from nozzles to melt and bond to parent material, enabling the combination and layering of different materials as well as fabrication and cladding. Parts can also be repaired and inspected through- out production, and infinitely variable control of laser spot diameters (ranging from 0.4 to 8.5 mm) increases efficiency and resolution, Okuma says. LMD also supports coolant use in the work envelope. Additional Laser EX series products to be intro- duced in the future will feature capabilities such as laser hardening for carbon steel material; process- intensive turn hardening and grinding; and the ability to repair resin molds, from crack removal to finishing, on a single machine. | Okuma America Corp. | 704-588-7000 okuma.com. 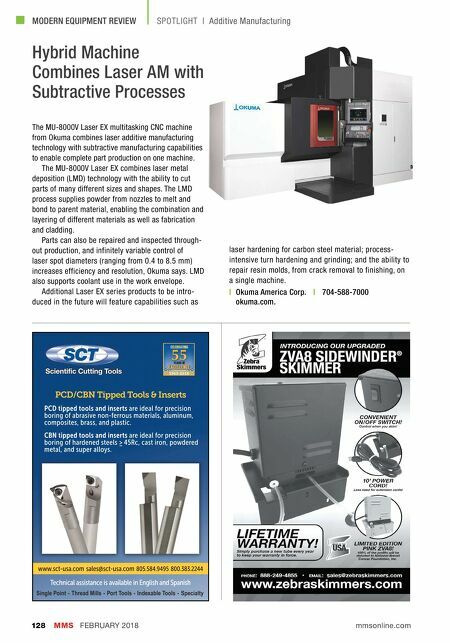 Hybrid Machine Combines Laser AM with Subtractive Processes www.sct-usa.com sales@sct-usa.com 805.584.9495 800.383.2244 Technical assistance is available in English and Spanish Single Point - Thread Mills - Port Tools - Indexable Tools - Specialty PCD/CBN Tipped Tools & Inserts Scientific Cutting Tools PCD tipped tools and inserts are ideal for precision boring of abrasive non-ferrous materials, aluminum, composites, brass, and plastic. CBN tipped tools and inserts are ideal for precision boring of hardened steels ≥ 45Rc, cast iron, powdered metal, and super alloys.